What single words would you choose to describe this special season of the year? 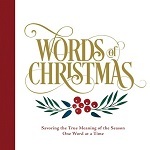 Covenant Communications offers a few suggestions in Words of Christmas: Savoring the True Meaning of the Season One Word at a Time (2015, 54 pages in hard cover, $14.99). The 25 words allow the book to be used as a type of advent calendar or to be savored singly as we rejoice and reflect on the birth of our Savior. It’s the perfect time-out from the busyness of the holidays. Some of those words are ones that resonate with us every day — family, Christ, love, kindness, celebrate — while others like peace, miracles, shepherds, angel, and Magi take on deeper meaning this time of year. Simple graphic designs accompany the single word, while the opposite page offers some reflection on the word in brief, poetic text, along with a short scripture and reference. Each is just right for reading aloud to the family. The pages include Clement C. Moore’s 1822 classic, “A Visit from St. Nicholas,” curiously uncredited here and titled “Night Before Christmas.” Did-you-knows, recipes, international traditions, trivia, and brief explanations of symbols of the Christmas season are sprinkled throughout the 232 matte-finish pages of this attractive hardcover book (Covenant 2015, $19.99). 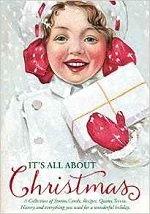 Another seasonal book that deserves mention here Charles Dickens’ beloved tale of Ebenezer Scrooge and the life-changing visitations of ghosts from Christmases past, present, and future, as told in a 2013 publication by Deseret Book. 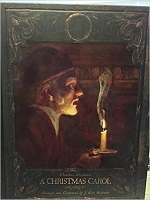 Artist J. Kirk Richards abridged and illustrated A Christmas Carol in a lovely hardcover book featuring his sepia-toned paintings that grow brighter as the story unfolds and Scrooge’s heart is changed. Even abridged, it contains substantial verbiage, but broken into the five “staves” of Dickens’ original, it makes a suitable read-aloud over a few evenings. I missed this gem the first time around but am glad to discover it now (48 pages, $24.99, now available at a large discount).